SAN FRANCISCO (AP) — Apple is planning to build a new corporate campus and hire 20,000 U.S. workers in an expansion driven in part by a tax cut that will enable the iPhone maker to bring an estimated $245 billion back to its home country . . . Excluding banks and other financial services companies, Moody’s Investors Service estimates corporate America has an estimated $1.6 trillion in overseas cash. Most of that is in the technology industry, with Apple at the top of the heap. Read more here. Omaha officials might be pursuing part of Apple’s expansion plan without even knowing it, by Cole Epley, Omaha World-Herald. “Prospective customers want to match their energy consumption with the energy output of a renewable project” like wind, said Tim O’Brien, director of economic development and external affairs for the Omaha Public Power District. “That’s what they are seeking to achieve.” A new electric rate OPPD introduced last January lets large-volume electric customers do exactly that, and it was pivotal in landing a massive Facebook data center situated on 134 acres off Highway 50 and Capehart Road in Sarpy County. Top 20 States: Click Infographic to enlarge it. 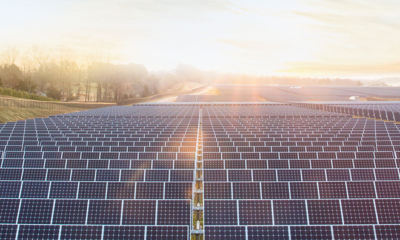 The historic Hearst cattle ranch has become a hybrid solar farm for Apple’s Cupertino campus; The ranch claims to be the nation’s largest single-source provider of grass-fed beef; The project is still expanding, with the second phase of the 2.5 million solar panels being installed this year. 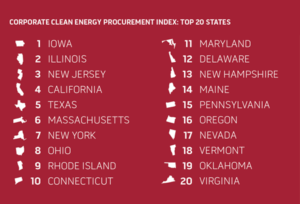 RESOURCES ON CORPORATE PROCUREMENT OF RENEWABLE ENERGY IN THE U.S. Emerging Green Tariffs in U.S. Regulated Electricity Markets. Nebraska pages 8 & 9. This video outlines the Renewable Energy Buyers Alliance’s ambitious 60 gigawatt goal and the value this coalition provides to customers. Several Buyers’ Principles signatories are featured. This entry was posted in Nebraska / Midwest News and tagged Apple's data centers, CNBC, Cole Epley, Corporate Clean Energy Procurement Index, corporate purchasers of renewable energy, Hearst Ranch, Omaha World Herald, OPPD's Green Tariff, Renewable Energy Buyers Alliance (REBA) on January 21, 2018 by Helen Deffenbacher.